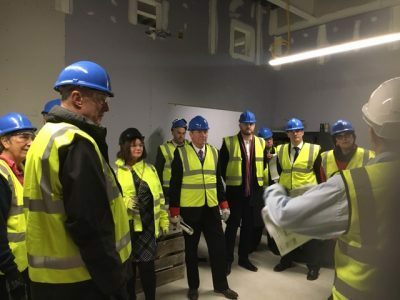 We joined local MP’s to see the new state of the art ‘Phase 8’ development at Burnley General Teaching Hospital. Following an invitation from East Lancashire Hospitals NHS Trust (ELHT), we spent time meeting staff and touring the construction site close to the hospital’s Casterton Avenue entrance. Construction of the new £15.6 million development – known officially as ‘Phase 8’ – began in April and remains on schedule for completion in Autumn 2019. “These are exciting times for Burnley General Teaching Hospital,” said ELHT Chief Executive Kevin McGee. The new development will boast a state of the art ophthalmology centre, outpatients department and maxillo facial facilities. On the ground floor, the easy access Outpatients Department will feature 21 consulting rooms and a dedicated blood room, an important specialist facility the existing outpatient facilities do not have. The new maxillo facial unit will have a laboratory, four consulting rooms and a minor procedures theatre. The new Ophthalmology Centre, on the first floor, will feature two theatres, eight clinic rooms, laser room, day unit and a dedicated injection room for macular patients. Check out the new development with a ‘Fly through’ film of the new Phase 8 facilities available here.